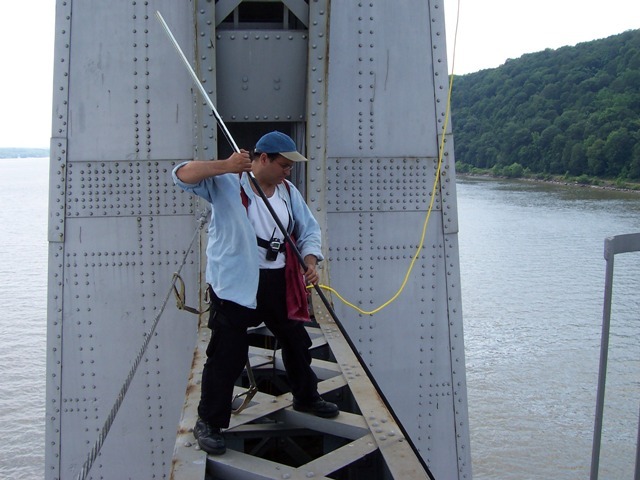 Poughkeepsie, N.Y. - The acclaimed Bridge Music Listening Stations returns to the Mid-Hudson Bridge for a fourth year. After receiving world-wide attention, Composer Joseph Bertolozzi?s unique and vibrant addition to the cultural scene in the Hudson Valley reappeared at the tower landings of the Franklin D. Roosevelt Mid-Hudson Bridge April 1. Joseph Bertolozzi has taken the abstract vibrations and sounds of the historic structure and combined them into something truly remarkable. The NYS Bridge Authority is proud to host Bridge Music, and we invite the public to experience this unique work of public art,? said Authority Executive Director Joseph Ruggiero. Bridge Music is free and open to the public on the pedestrian sidewalk of the Mid Hudson Bridge from dawn to dusk through October 31. Bridge Music can also be heard on 95.3-FM year-round over park radios installed at Waryas Park in Poughkeepsie and at Johnson-Iorio Park in Highland. Bridge Music opened to great acclaim in 2009, and is an official destination on the Walkway Trail Loop. The Trail Loop takes hikers, bikers and walkers from the Mid-Hudson Bridge to the Walkway Over the Hudson State Park in a scenic route through the City of Poughkeepsie and the Town of Lloyd. For more information on Joseph Bertolozzi and Bridge Music, go to http://josephbertolozzi.com/bridge-music-2/.